(a) Using a brush or a sponge, coat the application area of 2 new No. 2 windshield glass stoppers with Primer G.
If an area other than that specified is coated by accident, wipe off the primer with a clean piece of cloth before it dries. (b) Install the 2 new No. 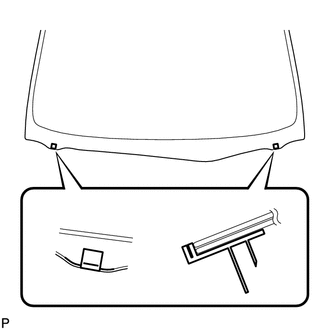 2 windshield glass stoppers onto the windshield glass, as shown in the illustration. Only the 2-piece type No. 1 windshield glass stoppers are supplied. Use the 2-piece type stoppers even if the 1-piece type stoppers were used. (a) Install the 2 No. 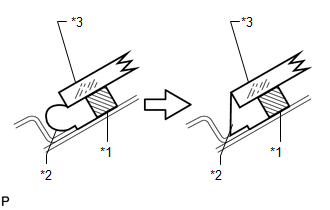 1 windshield glass stoppers to the vehicle body, as shown in the illustration. (a) Install 2 new windshield glass retainers. 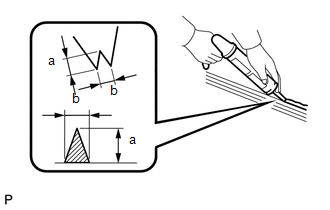 (a) Using a brush or a sponge, coat the application area of the windshield glass adhesive dam with Primer G.
(b) Install a new adhesive dam onto the windshield glass, as shown in the illustration. 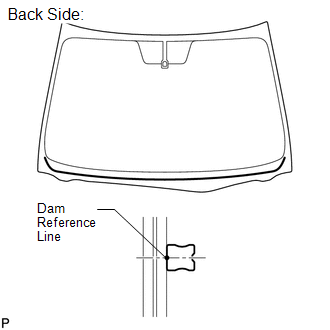 Install the new adhesive dam along the dam reference line. (a) Position the windshield glass. 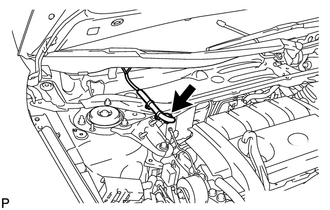 (1) Using suction cups, place the windshield glass in the correct position. (2) Check that the whole contact surface of the windshield glass rim is perfectly even. 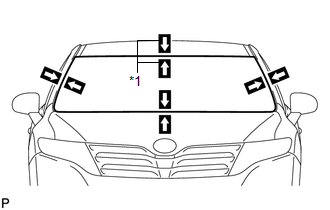 (3) Align the matchmarks on the windshield glass and vehicle body. Check that the windshield glass stoppers are attached to the vehicle body correctly. (4) Remove the windshield glass. 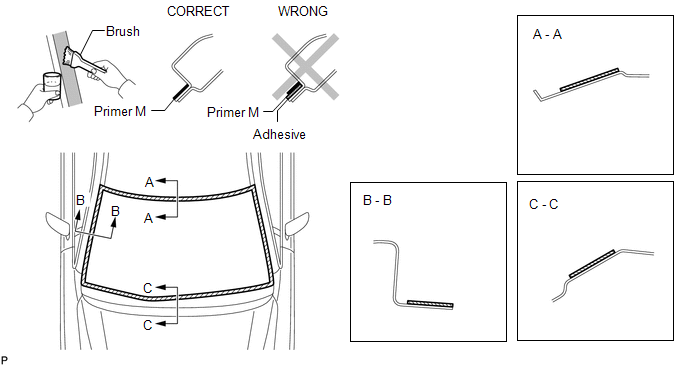 (b) Using a brush, coat the installation surface on the vehicle body with Primer M.
(c) Using a brush or a sponge, coat the application area of adhesive with Primer G.
Apply Primer G onto the ceramic notches. (d) Apply adhesive to the glass. 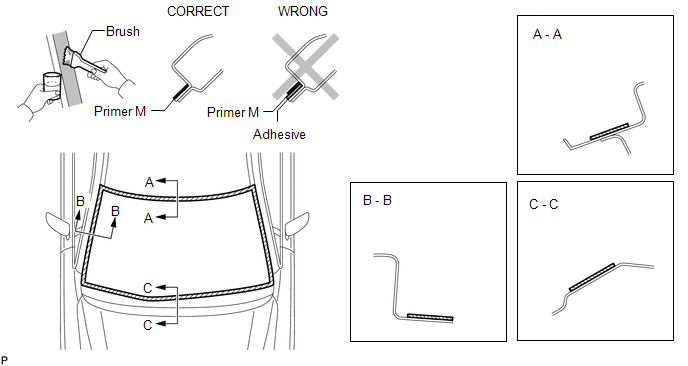 After cutting off the tip, use all adhesive within the time described in the table below. 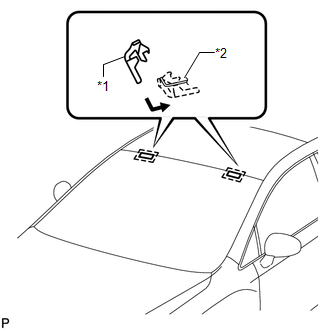 (3) Apply adhesive to the windshield glass, as shown in the illustration. Apply adhesive onto the ceramic notches. (e) Install the windshield glass assembly. (1) Using suction cups, position the windshield glass so that the matchmarks are aligned, and press it in gently along the rim. Check the clearance between the vehicle body and windshield glass. (2) Lightly press the front surface of the windshield glass to ensure that the windshield glass is securely fit to the vehicle body. (3) Using a scraper, remove any excess or protruding adhesive. Apply adhesive onto the windshield glass rim. (4) Hold the windshield glass using protective tape until applied adhesive becomes hard. Do not drive the vehicle for the time described in the table below. (a) Return the front section of the roof headlining assembly to the original position.